<< This was terrorism. It was an act of terror. And it was an act of terror committed by white supremacists. It was an act of terror that had been planned for some time by white supremacists. The killer had the words “UN Migration Compact” written on his gun. 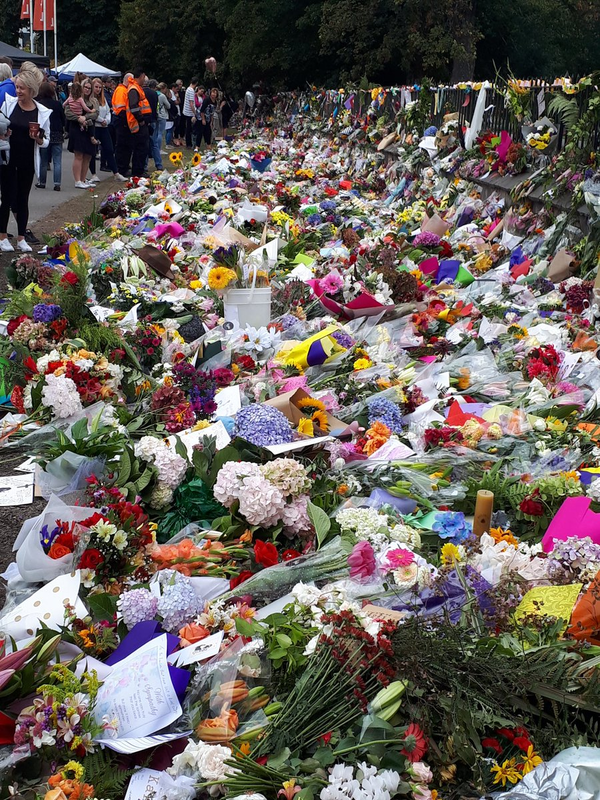 I think literally all the flowers in all the florist shops in all of Christchurch are at the memorial. It all feels like tissue paper. We know it's not enough but it's just we have to do something. The stench of genocide came here. And we all know the words that were on the guns. Many of them spoken by friends, relatives elected officials. << I want to be like Farid Ahmed, the Bangladeshi immigrant who has already forgiven the shooter who killed his wife. "If someone does bad to you, make sure you do good to them," Mr Ahmed said. << 'Respectable racists' like those in the media and politics might believe their beliefs are not as extreme as the shooter's, but their words fuel hatred. Westpac Bank NZ has halted all advertising on social media networks, including Facebook. @natecull How is the term "censorship" expressed in Te Reo? @alpacaherder It's expressed as "you're blocked and reported, mate"